Following hot on the heels of the Santa Cruz New Tech Meetup’s Women in Tech event last November, people are asking, what is next? Well, what’s next will happen at NextSpace in March. They call it the NextSpace Effect, and it’s not just a name, it’s a trademark. (I’m planning on trademarking the Tatum Effect — stay tuned). I was in downtown Santa Cruz at NextSpace meeting with Maya Delano, senior community manager at NextSpace, to get the inside scoop on the upcoming event when it happened. I witnessed the NextSpace Effect. Maya was explaining NextSpace’s background in the Santa Cruz community when she pulled nearby Sue Dayton into the fold of the conversation. Next thing I know there are four of us discussing this upcoming event on the couches by the faux fireplace. It was a true fireside chat. It is this very effect, this type of collaborative environment, that lent inspiration for the upcoming Women in Tech event. In fact, the event was born out of a literal water cooler conversation. The mission of this event is to help ensure that this tech community we’ve created here in Santa Cruz is one that welcomes women. The event takes place on March 5, 2019, 6:30pm, at NextSpace in Santa Cruz. A panel of women will share how they got where they are today, the challenges they’ve had to overcome, and advice they have for the next generation of women just starting out in the tech industry. 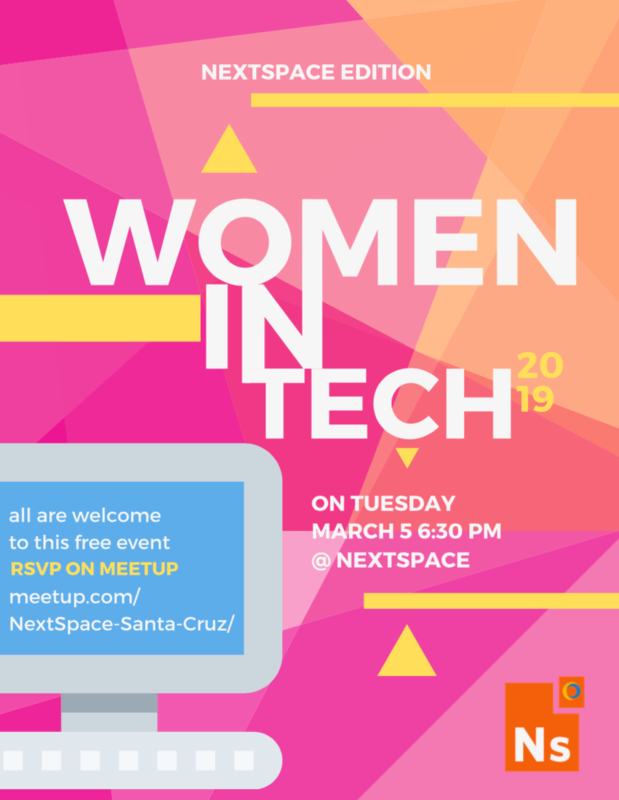 Although inspired by the previous women in tech-focused SC New Tech Meetup, this event will have a more intimate tone and dive deeper into the engineering end of the discussion, facilitating the sharing of ideas, and perhaps even offering some solutions and support. Leila Takayama, expert in human-robot interaction and Acting Associate Professor at UCSC. “Santa Cruz is a community-focused city. We want to make sure we welcome women in tech,” Sue Dayton says. Doors open at 6 pm and the panel discussion, followed by a Q&A session, begins at 6:30 pm. Sit down, get ready and enjoy the light refreshments as they get real about how to thrive as a woman in tech. Witness the NextSpace Effect yourself. Sign up to save a seat!